Kate Walter is a master teacher and award-winning writer who specializes in essays, memoir and creative nonfiction. 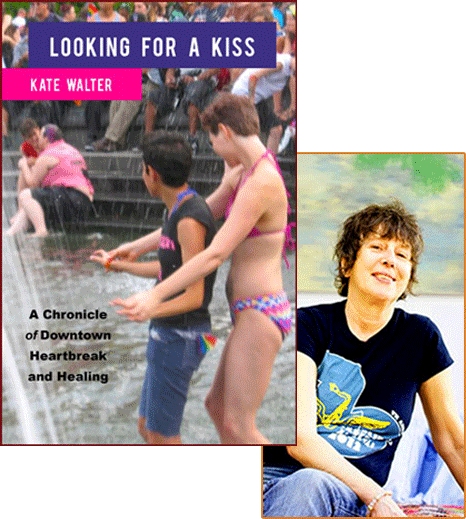 Heliotrope Books published Kate’s memoir Looking for a Kiss: A Chronicle of Downtown Heartbreak and Healing in June, 2015. Kate has over 30 years of diverse writing and editing experience. This includes articles for consumer and trade magazines, arts reviews, profiles, personal essays, opinion pieces, reports, newsletters and curriculums. She writes about divorce and dating, religion and new age spirituality, urban gardening and neighborhood gentrification, and life in an artists’ housing project in downtown Manhattan. Kate Walter has an MA in Media Studies from The New School. She teaches writing at CUNY and NYU and runs private workshops at Westbeth Artists Housing. Want to learn more about coaching or classes? Want to set up an interview about her memoir or receive a review copy? Contact Kate by email, call 212-627-4241, or follow her on Twitter: @KateWalter12.